1.) 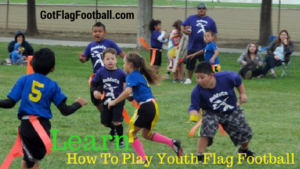 Find a flag football league for kids in your area or organize a recreational pickup game. Once you’ve found the best youth flag football leagues near me, for you and your child(ren), contact the league organizer or register online. Notify the league if you will be requesting to sign up with relatives or friends to form a team; most leagues will allow this. 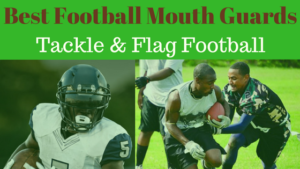 If you are not able to locate a league in your area: consider starting a youth flag football league or organize a flag football pickup game for your child and their friends. 2.) Read reviews on the best youth fag football equipment. Flag football league organizers for kids leagues typically go to great lengths ensuring participants have the safest and the best flag football equipment needed to play in their youth flag football league. The league organizer will always prepare the flag football field and ensure that it is lined up with visible markers (commonly cones to signal the first down and pylons at the front of the end zone to mark the goal line). Most league fields will be lined with field marker spray. Proper game preparation of the playing-field will assist young players in understanding the space of the field and learning the rules of the game played within that space. Specifically, the kid’s sized footballs that the league will provide (or that would be recommended for a game at home) will be ones that measure less in diameter and length and are lighter in weight than an adult football. This is to make it easier to be used by kids to handoff or pass the ball down the field. A smaller and lighter ball will be used with the youngest children. The specific size of the football will depend on the age and skill of the youth league participants. One of the key pieces of gear needed are, of course, flag football flags. In order to keep a fair level of play between teams, the league will specific which flags they use, in advance. 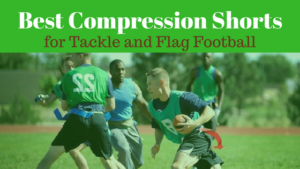 Flag football kits or sets, which include flags, belts and cones are a great way to kids to play at home or in a “pickup” recreational style of play. Whether playing in an established league, or in a pickup style, mouth guards are a necessity in order to prevent kids teeth and mouths from becoming injured. In regards to safety, flag football cleats are important to prevent slippage on the grass or turf and injuries to the feet or legs. This is the main reason not to consider using an average pair of flag football shoes or sneakers, but instead opt for a good pair of youth football cleats. 3.) Review the rulebook of the league and help your child understand the rules. It’s important for parents to understand how the game will be officiated so that you are aware of and considerate to the Field Directors and officials. At times, parents who take a high pressure approach to youth sports have been known to interrupt the flow of a game or to argue with officials, in an effort to change the outcome of plays in favor of their team. This seems to be human nature in sports, and is acceptable to some degree, however, if you are wise to the rules of the game, it will go a long way to avoiding confrontational situations that unfortunately do arise at time in youth sports. 4.) Introduce yourself to the team coach and parents. Often time, each new season brings together a new team of players. There may be a few familiar faces, however it is normal that new teammates will be added to the team or switch to new teams, even if your child has played in the same league for several seasons. It will help your child to make friends and will ensure that you have some acquaintances to enjoy games with on the sidelines each week for a couple of months, if you as the parents, are friendly with the parents of teammates and the coaching staff. Also, be sure to introduce yourself to the team coach in advance, by email or phone and in person. It is also important to know at least the name and contact information of the man or woman, and their assistant coaches, who will be leading your youngster on part of their journey as they learn to play flag football. 5.) Practice throwing, catching and running at home. It can be time consuming and require dedication on your part as a parent to practice the basics of the sport, off the field and at home. If you aren’t very experienced as a player yourself, it can be a bit daunting to try and teach your child how to play flag football. However, when possible, it is helpful for your child’s enjoyment of the game and also keeps them outside and active whenever Mom and Dad participates with them. It will of course help them progress in skill level come gametime as well. 6.) Encourage your child to communicate with other players and listen and ask questions to the coach. As the saying goes, football truly is the ultimate team game. This applies to flag football as well! Participating in youth sports is an excellent way to show your child the benefits of teamwork. They will learn to play constructively with one another, which often carries over off the field as well. Encourage them to ask questions to the coach or assistant, if they are unsure of their role on the field or of a particulate situation in the game. A good coach will help them learn the fundamentals of the game and enjoy the team element. 7.) Take it easy on your little one and help them enjoy themselves and make friends. Most youth flag football leagues are not meant to facilitate a professional level of sport’s intensity. In contrast, they are designed to encourage your child to enjoy the benefits of being an active kid (and hopefully remain that way well into adulthood). Additionally, youth leagues provide a place for children to learn the basics of the sport, while enjoying the structure of an organized game with their peers. Most often, these leagues help kids understand how to play flag football for beginners or intermediate level of experience. Therefore, it is important to remember that players between the ages of 4-14 are not playing a professional level of the sport. Remind them of this as parents and try not to put the focus of winning and on excelling to an elite level of play, unless / until they are old enough and experienced enough to appreciate a more competitive version of flag football. Flag football is a version of the game of US tackle football, played as a sport by boys, girls between ages 4-14 and adult flag football leagues participants (high school age and beyond). In most youth leagues, point totals aren’t the focal point of the game, however by definition, the final goal in a game of organized flag football, as in tackle football, is to outscore the opposing team within a certain time period, thereby winning the game. When in possession of the ball, the objective is for the offensive players to advance the football across the goal line of the end zone, thereby scoring a touchdown. Offenses have a minimum of four plays to pickup a first down by crossing the first down marker, which is usually placed within 20 yards of the original start point, thereby continuing the drive; score a touchdown without gaining a first down; or else elect to “punt” the ball to give possession back to the opposing team. The defenses goal, then, is to stop the offense in as few plays as possible. This can be accomplished by pulling the ball carrier’s flag on consecutive plays, prior to the offense crossing the first down marker or the goal line. A main point of contrast between flag football and tackle football is the level of contact that is allowed to occur between two opposing players, during a live play. The biggest distinction is, of course, that in tackle football full contact occurs between players. Unlike in youth tackle leagues, in the sport of youth flag football tackling is prohibited. In youth flag football, no contact of any sort is allowed. Incidental contact may occur, and if so, the official will speak with both players and check to see if there is an injury or any sort, before calling a penalty or resuming play. Without the ability to tackle each other, the only way for a defender to end a play is by pulling the flag or removing the entire flag football belt of the ball carrier. The official will blow the whistle after this happens, the play will stop, and player on offense and defense will huddle up and prepare for the next play. Whereas in tackle football the format is 11 on 11, meaning there are eleven players occupying the field on both defense and offense, in a game of flag football the maximum number of players on offense and defense at any given time are usually does not exceed 9 at most and 4 at the least. It’s important to note that there is not one single set of rules in the sport of youth flag football. This is one aspect of defining the game of flag football that few other websites accurately cover. Much of the information available regarding rules state the specific rules of a particular league or pickup game. For example, under some sets of flag football rules for kids, the ball is marked down at the spot of the ball carriers feet; in other league rulebooks the ball carrying player may extend their reach to gain extra yards. In essence, it’s nearly impossible to outline all of the potential rules of flag football as there are too many variations to cover. If there are 3 flags on the belt, one must be located on the each hip and one down the back. If there are 2 flags, one must be placed on each hip. A mouth guard must be securely covering a players upper teeth before play can begin. All offensive players are eligible to receive forward passes. Spinning to avoid a flag pull is always allowed. Making contact of any sort with the quarterback. Stiff arming, or “flag guarding”, meaning to block a defenders attempt to pull the ball carrier’s flags, is not permitted. Impeding an offensive players path is not allowed; defensive players may pull the ball carrier’s flags while in front of them, but they can not physically block them in the process. All offensive players are are entitled to catch a forward pass that is thrown, or handed off, from behind the line of scrimmage. The fact that the offensive lineman are considered eligible receivers in flag football, increases the number of available offensive players to distribute the ball to, which in turn increases the number of possible ball carriers that the defense must cover. This variation deviates from the rules of traditional football where offensive lineman may only block the pass rushing defensive players attempting to “sack” the quarterback. Since youth flag football is a non-contact sport, there are no platers for the offensive line to block. Therefore, in flag football offensive lineman are allowed to catch the ball and score touchdowns. Apart from that positional difference, flag football players occupy positions on the field of play that are very similar to those that compose a tackle football team. In youth flag football, it is not common that kids will play only one set position on offense or defense. In many leagues, in fact, it is a requirement that the coaches rotate players between various positions, giving each player the opportunity to enhance their skills and understand the fundamentals of the game. Youth flag football has evolved into one of the faster growing sports in the world, due in part to many parents opting for the non-contact version of the sports. Awareness regarding concussions has surely contributed to this sports rising popularity. Additionally, it is a co-ed game that a game can be played with four or more player per team, minimal flag football equipment and an adaptable set of rules. Ultimately, flag football provides a means for kids to stay physically active and enjoy the social aspects of playing a team oriented sport, well beyond their childhood years.